For many people, Father Christmas, the Easter Bunny and the Tooth Fairy are the first “heroes” they believed in. These icons were introduced to us at early ages and impacted our lives in many different ways, but all along the same theme, bringing wonder and joy at specific times of year or points in our lives. At a time when superhero movies make up the summer schedule, turning these characters into a super-team of their own feels like a no-brainer and Rise of the Guardians does it very effectively. The first thing you’ll notice is the great character design. Some play on the usual ideas, Santa is a big jolly man with a white beard and cool sleigh and the tooth fairy is helped by the traditional idea of what a fairy is. Others come with slight difference in style, like the Easter Bunny being an Australian with an attitude. All amount to some great character though and you can really get behind the different heroes. This is partly down to the great voice cast. Alec Baldwin is great as a Eastern-European Santa Claus, while Hugh Jackman is full Australian as the Easter Bunny. The most effective voice acting is with Jude Law as the villain of the movie, the Boogeyman Pitch Black. His British tones add menace to the character and help sell the threat that this one man brings to all of the Guardians. It is a credible threat too. To the movie’s credit, Pitch Black has a decent reason for being angry and the movie is hinged on the idea of kids “believing” in these characters and the strength it offers. 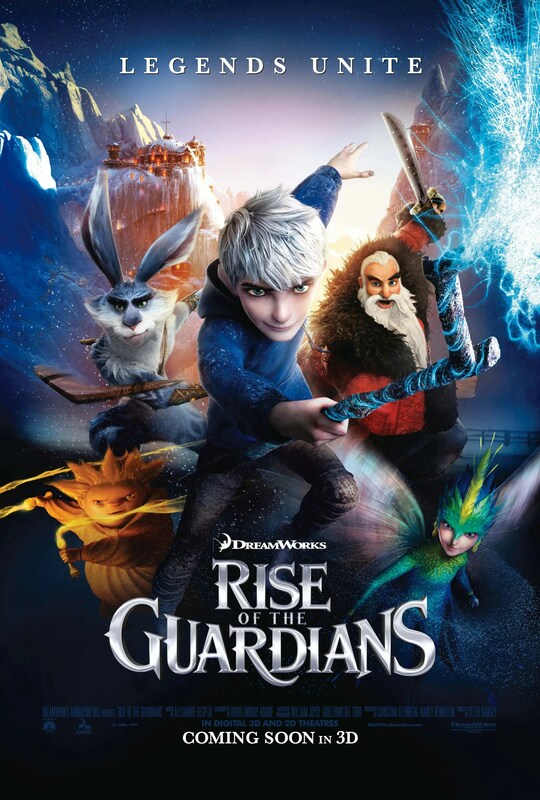 As a decent storytelling device, the youngest and rebellious new addition to the group, Jack Frost, voiced by a cocky Chris Pine, becomes a good mirror to the villain, with a very familiar story. There is a lot that is inventive about the movie. The way that Santa goes from place to place, a natural rivalry with the Easter Bunny and one great sequence where the Guardians are forced to do the work of the Tooth Fairy all add to the humour and great characters that the movie has created. They even manage to turn a spoilt, whiny brat in Jack Frost, into a character you can feel sympathetic and genuinely root for. There is a lot of positive in Rise of the Guardians, which is why you can overlook the fairly standard and generic ending that makes up the finale. There won’t be any surprises to how this movie turns out but there is enough charm in the first two acts that you won’t mind how familiar the ending becomes. In fact, it is a huge shame that this movie wasn’t more popular. For an animated movie, with a lot of superhero-type characters, there is loads of fun and potential here for a decent franchise. Unfortunately, this seems like a one-entry movie. Overall, Rise of the Guardians is a solid movie with some great characters. The voice acting brings the heroes to life, with Jude Law’s villain stealing the movie. There is a lot of creativity within the film, which helps you overlook the fairly generic and predictable ending.